NEW YORK TIMES BESTSELLER - NATIONAL BOOK AWARD FINALIST A New York Times Notable Book Named a best book of the year by Amazon, Wall Street Journal, The Boston Globe, San Francisco Chronicle, GQ, Time, Newsday, Entertainment Weekly, Time Magazine, NPR, Vogue, Smithsonian, Cosmopolitan, Seattle Times, Bloomberg, Lit Hub, and Slate From the #1 New York Times best-selling author of The Lost City of Z, a twisting, haunting true-life murder mystery about one of the most monstrous crimes in American history In the 1920s, the richest people per capita in the world were members of the Osage Nation in Oklahoma. After oil was discovered beneath their land, the Osage rode in chauffeured automobiles, built mansions, and sent their children to study in Europe. Then, one by one, the Osage began to be killed off. The family of an Osage woman, Mollie Burkhart, became a prime target. One of her relatives was shot. Another was poisoned. 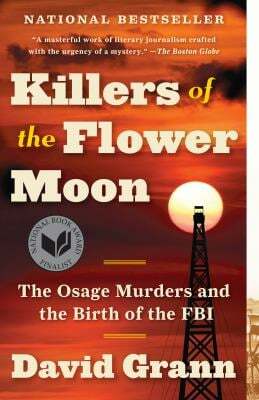 And it was just the beginning, as more and more Osage were dying under mysterious circumstances, and many of those who dared to investigate the killings were themselves murdered. As the death toll rose, the newly created FBI took up the case, and the young director, J. Edgar Hoover, turned to a former Texas Ranger named Tom White to try to unravel the mystery. White put together an undercover team, including a Native American agent who infiltrated the region, and together with the Osage began to expose one of the most chilling conspiracies in American history. New (1309 available) BRAND NEW. Over 1.5 million happy customers. 100% money-back guarantee. Make your purchase count: support Better World Books' worldwide literacy partners.